Time for school to start again!! Next week people... and I can actually accomplish things...next week!!! 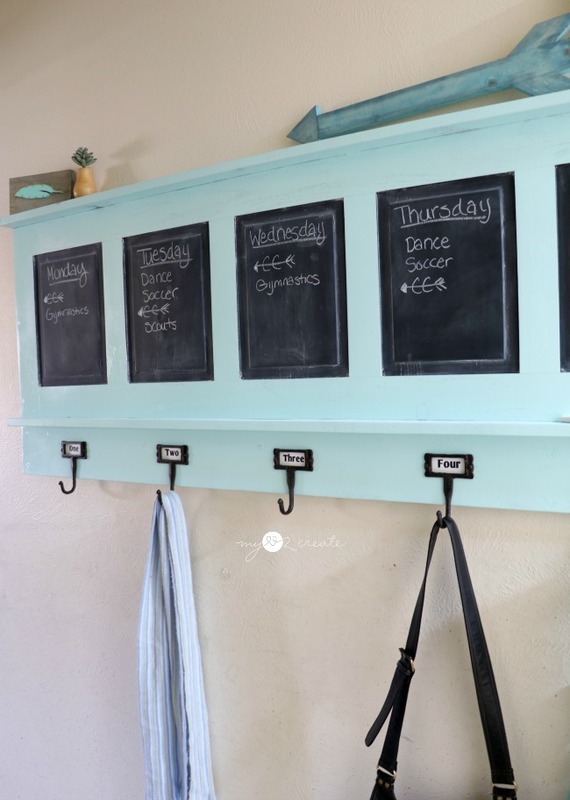 Today I have the perfect back to school project for you, a Repurposed Chalkboard Coat Rack! I can't tell you how much I love this thing! Seriously. I know this because I have been using it for many months since I first posted it at My Repurposed Life as a contributor post last year. 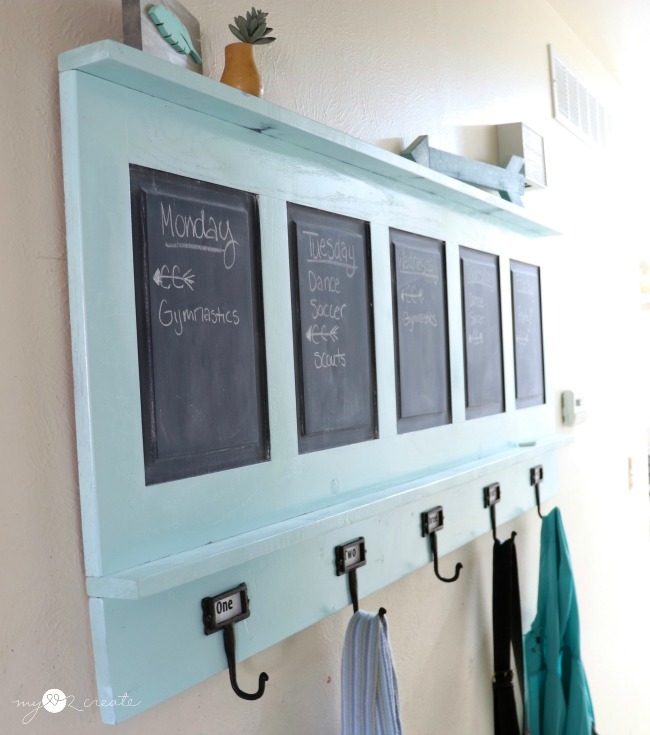 Unfortunately I don't have a place for a mudroom (only in my dreams!) so I put it in my upstairs hallway, and let me tell you this baby has gotten some great use holding my kids backpacks all year! 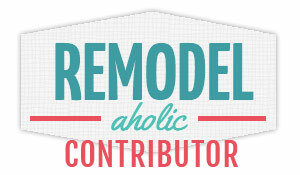 Supplies: (this post contains affiliate links that help me at no cost to you, so thank you!! Read more. Here is a before of my inspiration piece. 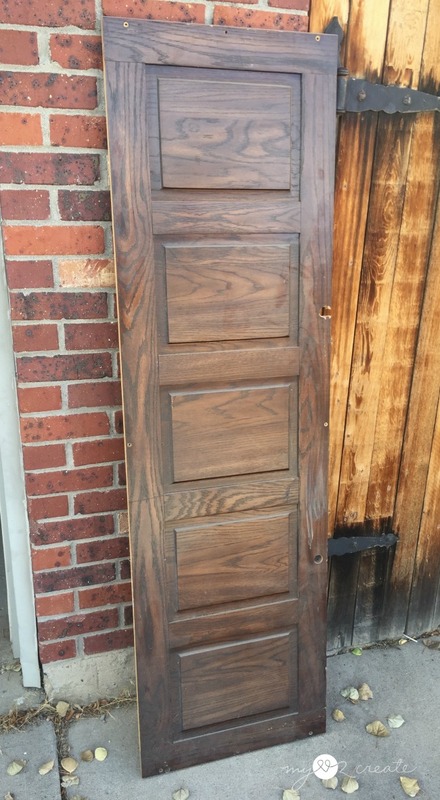 I grabbed this from the side of the road in front of a house with a free sign on it. It was a part of a desk that had been taken apart. 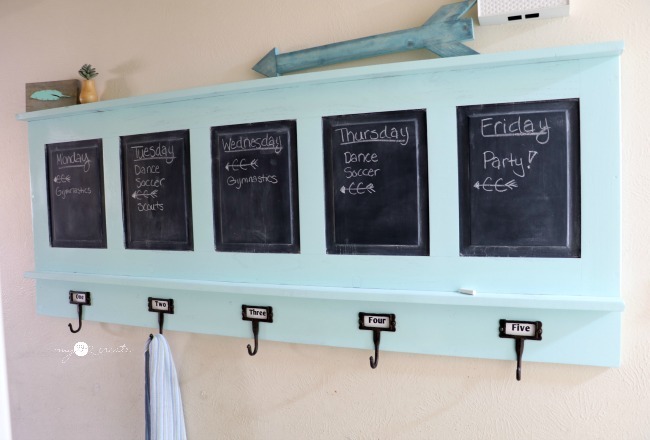 When I first picked this up I knew it needed to be some sort of command center or coat rack with chalkboards. It has been at least 2 years, and that image has never left me so I finally decided to make it! The first thing I needed to do was patch the huge holes that were on the side. 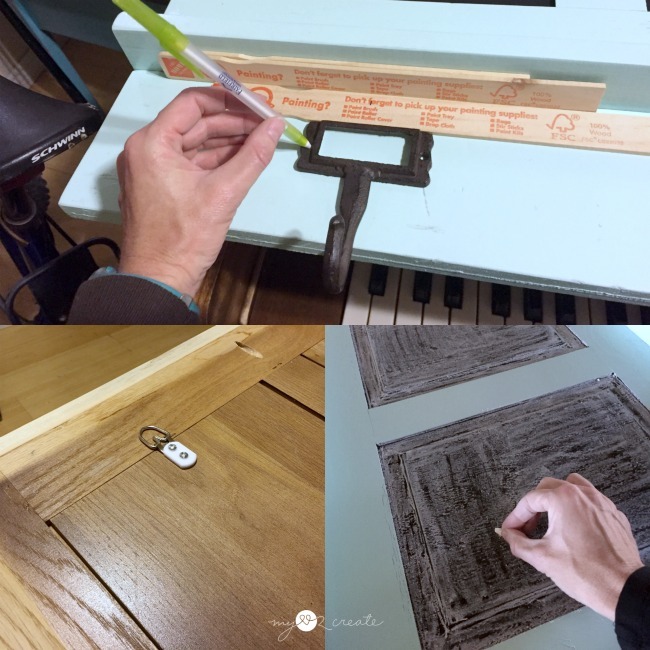 I decided to trace the shape of the holes on a scrap piece of wood (top left) and then cut them out with a jigsaw. In the top right photo you can see they were not cut out perfectly, and that was fine, because after I filled it with Spackle , let it dry, and sanded it flat, it was perfect! Perfectly smooth, and filled. The second hole on the bottom right was filled as well. 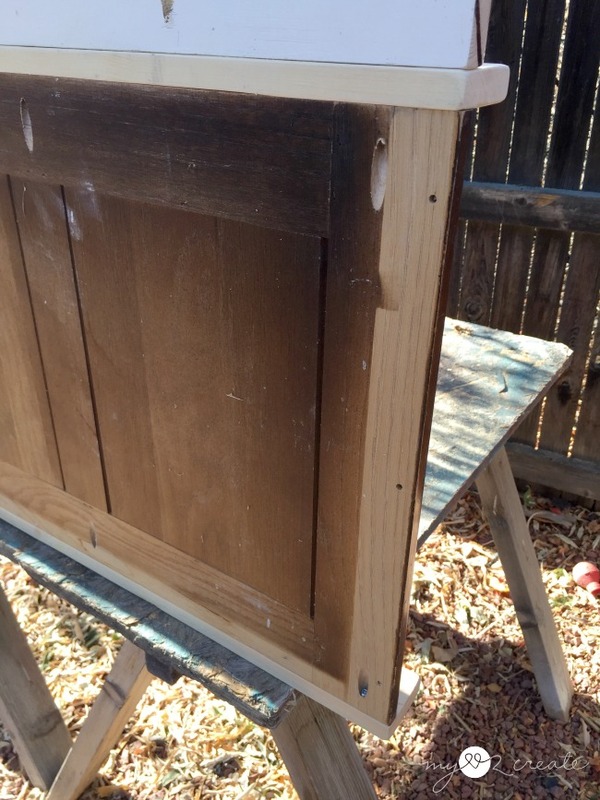 Once I had the holes filled I found some scrap wood and started deciding how to beef it up. I planned to add a top and bottom 1x3 to make a top shelf and bottom ledge. This is when I realized that I really needed more space for my hooks. 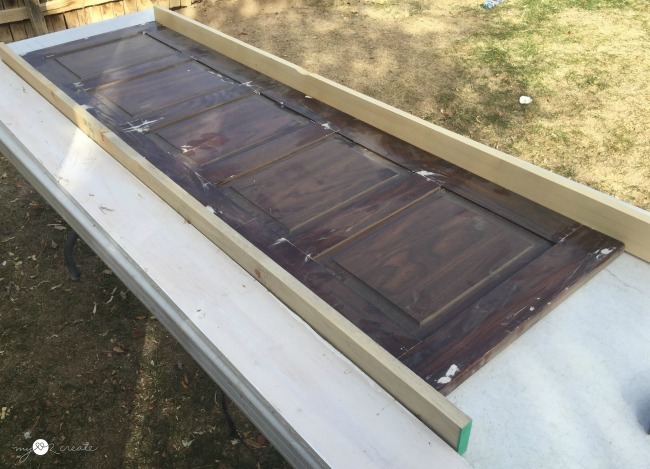 I looked in my wood stash and found a 1x6 board that I could attach to extend my piece. 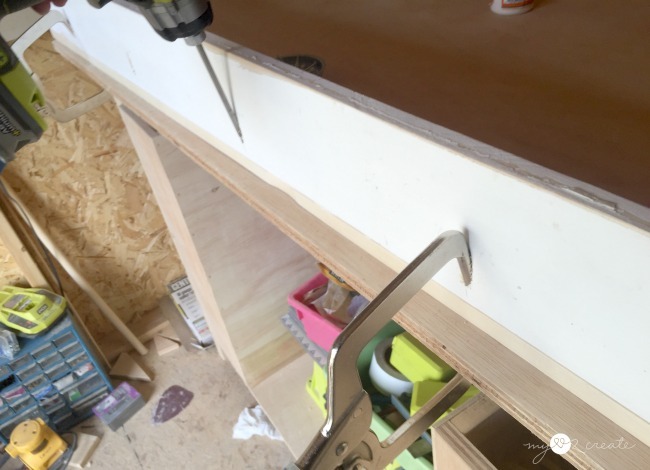 I knew that attaching with pocket holes was the sturdiest and easiest method. 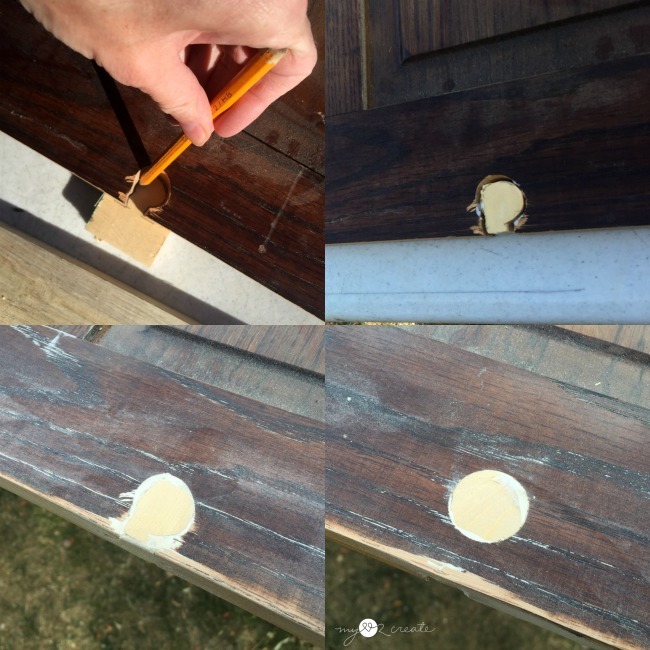 I drilled them using my Kreg K5 Pocket-Hole Jig into the desk panel on the top and the bottom, every 6 to 7 inches. I also drilled them into the 1x6 as well (not pictured). 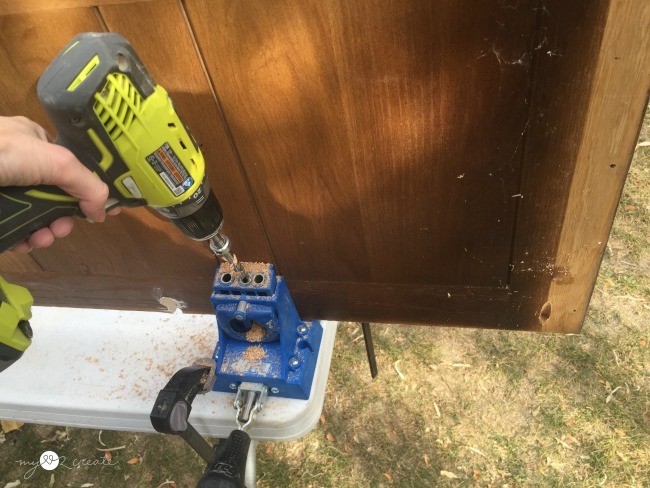 I connected the 1x6 to the 1x3 bottom ledge with wood glue and 3/4'' pocket holes and 1 1/4'' pocket hole screws. You can see I used my Kreg Right Angle Clamps to hold things in place. Now I needed to attach the panel to the bottom ledge section. I clamped the ledge down with my bar clamps bar clamps (left) then used wood glue and screwed the desk panel onto the 1x3 bottom ledge, using my pocket holes and screws (right). 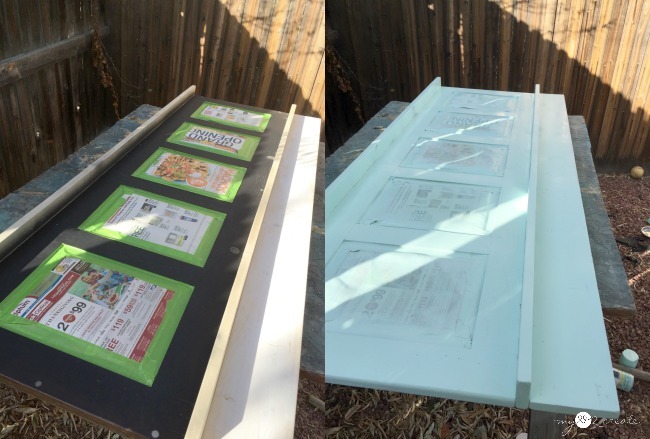 Then I flipped it over and attached the panel to the top 1x3 shelf, and that was it! 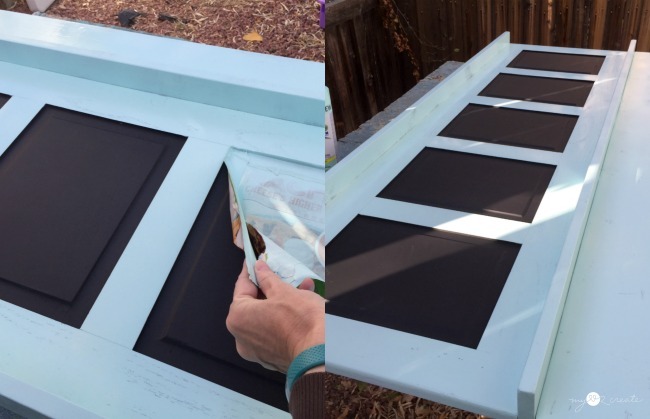 I decided to use up the rest of my Rust-Oleum Chalkboard Spray paint on the raised panels. 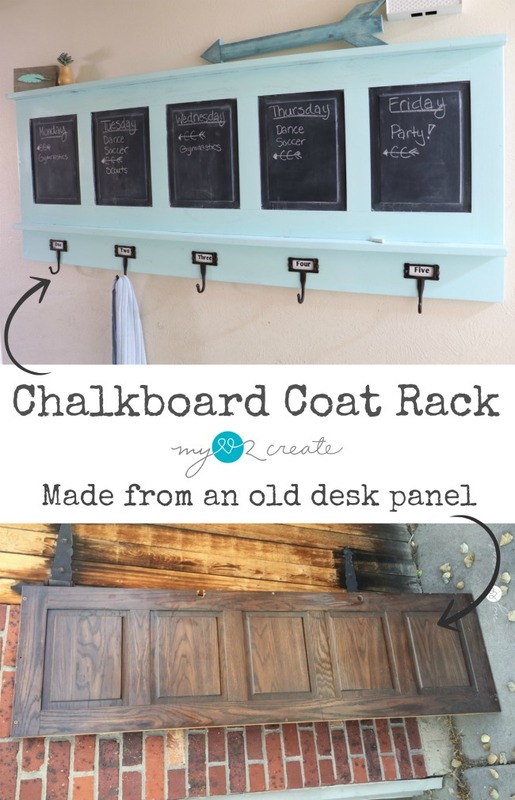 After it dried I taped over the panel sections that I wanted to stay as chalkboards, and spray painted the rest of the coat rack with Rustoleum's Gloss Ocean Mist. I had some left over from my Repurposed Cupboard Door Bookshelf so I decided to go with what I had. I carefully pulled off the paper and tape while the paint was still wet. Look how perfect those chalkboard sections are! I love Chalkboards! I marked where my hooks needed to be on front and used some paint sticks as spacers to make it so I didn't have to measure down every time. :) Then I added two large d-rings to the back for hanging, this thing is heavy! It is 64'' long! 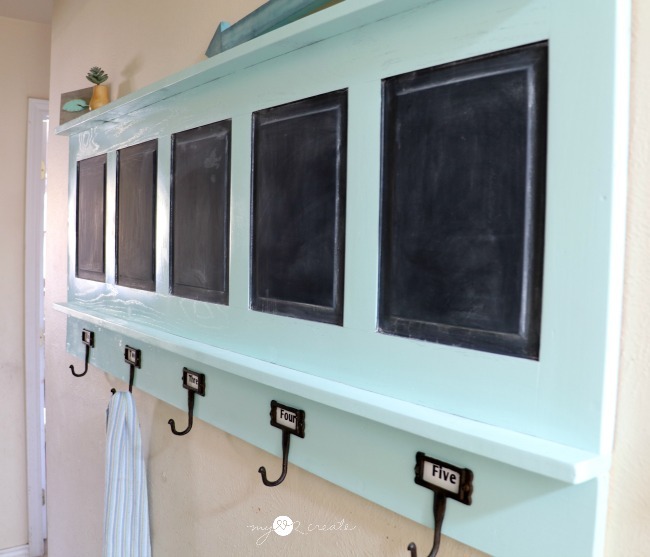 Lastly I primed my chalkboard surfaces and it was ready to hang! I got the cast-iron hooks at Hobby Lobby when they were 50% off, so I spent $10 on hooks, and that was it! 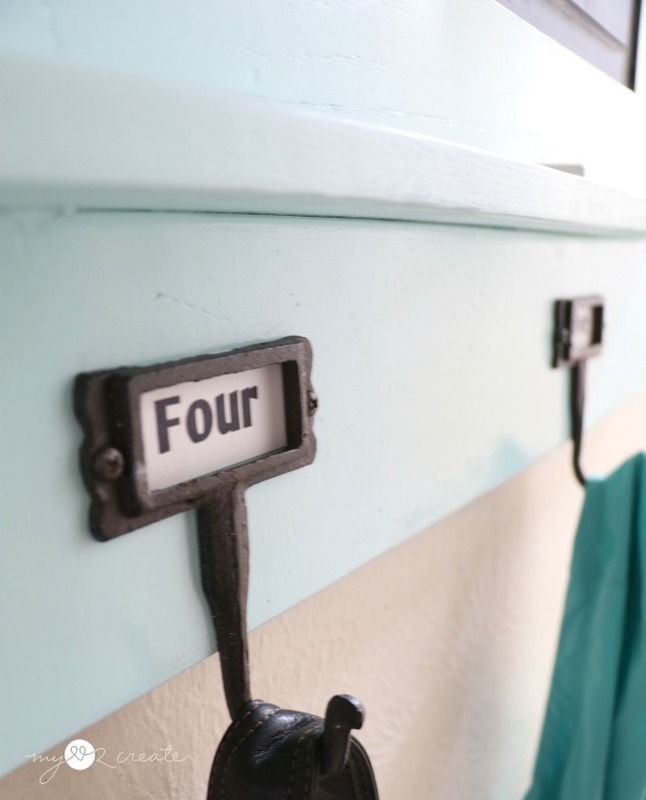 I made the number labels for the hooks since they didn't come with any, I think they would be cute with names too. When I first built this I was thinking I would sell it, but my kids ended up using this for their backpacks in stead of the ones in their rooms. Ha ha! Plus having a schedule on the chalkboards is super nice! Where would you put this?! 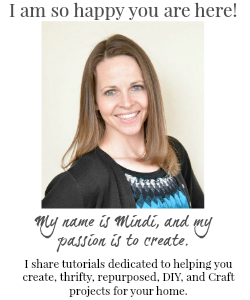 Hi Mindi, love your project. It turned out awesome. Happy back to school, hope you enjoyed your summer.